Afrah Nasser's Blog: Schizophrenic Yahya! 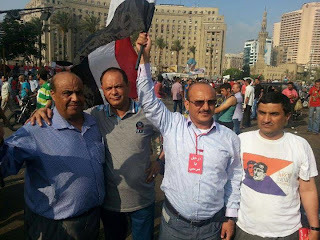 Ex-president Ali Abdullah Saleh's nephew and former head of Yemen's central security forces, Yahya Saleh is at Tahrir in Cairo to support Tamroud. He's wearing a small poster that says "Leave, Morsi!" It's not his first time to show solidarity to "democracy", he wore Syrian Free Army flag awhile ago. However, when he was asked one year ago or so about Yemen's uprising, I remember very clearly his response, he said, "what's happening in Yemen is just a chaos." Schizophrenic Yahya!